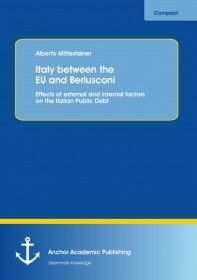 The aim of this study is to investigate whether the reduction of the Italian public debt between 1994 and 2004 and the increase after 2004 is due to internal or external factors. Given the current debt crisis in Europe, this is a fundamental question since it may demonstrate if Italy - and states in general - are able to handle their fiscal problem by themselves or if they need external help. The evidence, in the form of a detailed analysis of parliamentary debates and newspaper articles, will show that Italy was able to reduce the public debt only when pressured from outside and that the external constraints of the European Union in the form of Maastricht Parameters greatly impacted the level of Italian debt. Once Italy complied with them and became a member of the European Union, the effect disappeared and the Italian public debt started increasing again. Internal factors do not appear to have played a role. In particular, the qualitative study of parliamentary debates on the budget shows that the level of polarization and the role of veto players caused by it have remained constant and therefore can’t be used to explain the variation in public debt.